Exeter fly-half Myles Dorrian is to return to his former club Bedford on loan for the rest of the season. 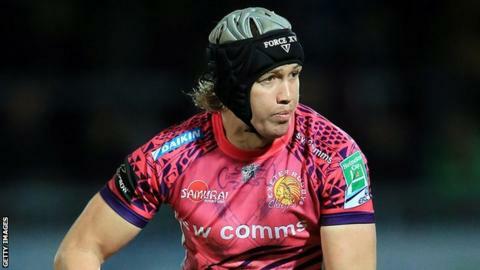 Dorrian has played just nine times for Exeter and has never featured in a Premiership match for the Chiefs. He played twice for the Cornish Pirates in the Championship last season after to the Mennaye-based club during an injury crisis. "Obviously we have several players here that just want to be playing rugby and now that we've concluded our A League and our LV= Cup programmes, some of these guys have asked if there is an opportunity to play rugby somewhere," said Exeter boss Rob Baxter. "Myles is one of those guys and there was an opportunity up at Bedford, a club he knows very well, so it's good for him to go and play. "We will obviously get the opportunity to see him play and we'll keep close tabs on him whilst he is up there." Dorrian's return to the Championship has been welcomed by Bedford boss Mike Rayer. "Having Mylo back is a real bonus for us as we strive to finish in the top four and make the play-offs," said Rayer. "We are entering a very critical time in the season and having a steady head like Myles on board gives us another great option at 10. "We are looking forward to seeing how he has matured and improved in such a great environment at Sandy Park."